EPA Chief Scott Pruitt Questions Basic Facts About Climate Change : The Two-Way In an interview with CNBC, President Trump's EPA administrator said he did not believe carbon dioxide is a major contributor to global warming. Scott Pruitt's comments on carbon dioxide come just over two weeks after he took the helm of the Environmental Protection Agency, the agency with the authority to regulate CO2 and other greenhouse gases as pollutants. 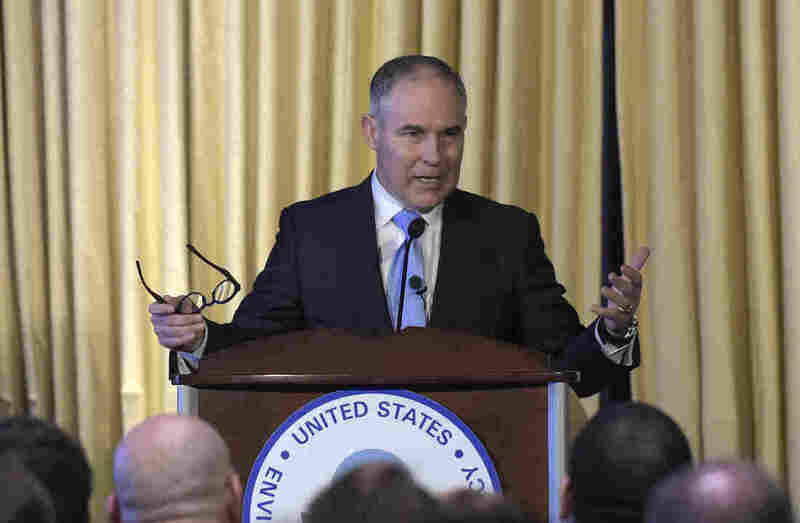 "I believe that measuring with precision human activity on the climate is something very challenging to do, and there's tremendous disagreement about the degree of impact," Pruitt said. February 2017 was the second-warmest February on record, according to NOAA. Pruitt's views are consistent with earlier comments he has made on the topic of climate change. As attorney general of Oklahoma, Pruitt often claimed that there was scientific uncertainty over whether humans are changing the climate. Pruitt's comments come just over two weeks after he took the helm of the EPA, the agency with the authority to regulate CO2 and other greenhouse gases as pollutants. In 2014, the EPA unveiled rules that would require substantial reductions to greenhouse gases from power plants as part of a broader effort to limit global warming. The rule was contested by industry and states, and is currently under review in the courts. Pruitt also said he believed that a major climate agreement reached in Paris was "a bad deal," and that he would soon be making an announcement about changes to so-called CAFE standards, which set fuel efficiency goals for cars and trucks. Pruitt's latest statements on climate change come after the second-warmest February in the past 123 years, according to NOAA.